The staff were very helpful. Sam at reception was extremely helpful and friendly. The food in the restaurant was very good. We ate there on two occasions. My daughter liked the buffet breakfast and sauna a lot. The breakfast was delicious and the grounds were beautiful. The horses do not belong to the property but we went to see them several times. There was also a playground advertised but there wasn’t one when we visited. The on-site restaurant food was not the greatest and after we were served the staff was no where to be found. We wandered the lobby and the bar and still couldn’t find anyone. Eventually the bartender showed up and asked us to sign our check. Otherwise our stay was great with 2 small children, they had a pack and play style crib for our stay that fit our 2.5 year old great. Beautifully located within a green paradise. Rich breakfast. Have stayed here many times over the past several years. Ideal setting in beautiful grounds. Be aware that the bedrooms are in a separate building to the chateau but this has been very tastefully constructed in keeping with the chateau. The public rooms are within the chateau just a brief stroll away and these make for a very pleasant setting for a drink or light snack in the evening - or for a meal in the restaurant. The bedrooms are a generous size and nicely furnished - the beds are exceptionally comfortable. Breakfast is of good quality and with plenty of choice. The breakfast room is within the accommodation building but overlooking the lawns towards the château. Access is very easy from the motorway network. Suburbia is not not far away but once in the grounds you would never know it. Very professional staff with fluent English if you need it. We will be back! Location is amazing, in country, between two villages. Very peaceful, and still equipped with many sport and spa facilities. Unfortunately, to short visit and no possibility to enjoy in them :( Also, several nice places in neighbor - born village of Jean Gabin, thomb of Vincent van Gogh and others. The grounds of the hotel is very nice. The Château has very nice look. The swimming pool is big bonus specially after a long day. The bed was absolutely comfortable !!! Good service! Comfortable hotel for a short stay. Efficient rooms, though a little outdated. Breakfast in a rather 'cheap' area. not 4 star accommodation like. Food however okay, simple but everything present. Rooms in a seperate building so you need to go outside about 100m for the bar and restaurant for dinner. Free parking. Restaurant in Château in the evening was very good. Excellente literie, personnel très sympa, endroit calme, paisible et cosy. On a 35-hectare site, the hotel is in a 19th-century château and is only 16 miles from Roissy Charles de Gaulle Airport and 11 miles from Paris. The hotel Novotel Château de Maffliers features modern rooms in a building 150 feet from the main building. A private parking lot, a sauna and an indoor heated swimming pool are also provided. It also has11 bright meeting rooms that can accommodate up to 100 people, a restaurant with terrace, Le Novotel Café, and an English bar, Les Boiseries. The Château de Maffliers is the ideal backdrop to a relaxing family vacation and it also features all the necessary facilities for a business trip. Free Wi-Fi access is available throughout the property. This property also has one of the top-rated locations in Maffliers! Guests are happier about it compared to other properties in the area. This property is also rated for the best value in Maffliers! Guests are getting more for their money when compared to other properties in this city. When would you like to stay at Novotel Château de Maffliers? This air-conditioned room features free Wi-Fi access, a private bathroom and a TV with satellite channels. It is decorated in a modern style and includes a minibar and safe. Some rooms have views of the park or the castle. This air-conditioned room features free Wi-Fi access, a private bathroom and a TV with satellite channels. Additional facilities include a minibar,a Nespresso coffee machine and a bathrobe and slippers in the private bathroom. This triple room features a cable TV, tea/coffee maker and sofa. This triple room features a electric kettle, tea/coffee maker and soundproofing. House Rules Novotel Château de Maffliers takes special requests – add in the next step! Novotel Château de Maffliers accepts these cards and reserves the right to temporarily hold an amount prior to arrival. Smell of pool. Breakfast could be little bit more various. Cannot think of anything. Wish we could have stayed longer. The breakfast is expensive for what you get and the person taking care of the breakfast was not friendly and helpful to customers questions. Some staff members are not friendly, some are rude. Not concerned with your satisfaction. Service in the restaurant is slow. Menu is really simple. Don’t expect options. Rooms are far from the convention area. Snow is not removed. You need to walk out in the snow from hotel to Convention rooms. The property is beautiful. Landscape is nice. I didn't like that we had no wash clothes. The breakfast was $16.50 should have been included. I was very upset when they issued my bill to someone else without asking for I'd. Someone ended up with all my personal information. Seemed to be lack of staff all around. we were sent to the wrong floor for our room! the week end staff was depressed i had to request a change of room because the ventilation was not wirking well. they kindly moved me to an executive suite. but for that price and due to a greaaaaaat advertising( photis embellished etc...) i expecyed better. The estate. 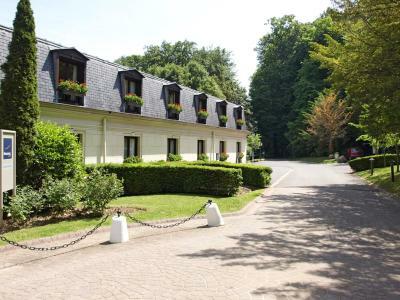 Beautiful park, indoor swimming pool, tennis, nice bar and other facilities in the Château. Good food. Room was quite small for 3 people . No hard copy of info available for guests to read about facilities at hotel or nearby.. Was advised to view webpage but i didnt find a lot there. Would not call room 4 star. No shops or restaurants nearby (other than restaurant on hotel grounds).